Is your Oster Blender Blade missing, leaking, dull or broken? You may need a new Oster Blender blade 031014-104-000. 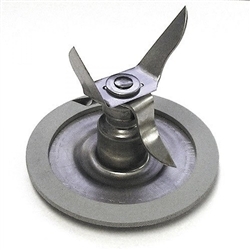 This blender blade fits most Oster Blenders, Osterizers and all Oster Kitchen Centers and restores thorough blending performance to your blender. Leaky blender blades are history when you replace with this original Oster blender part. Hand wash carefully - these blades are sharp! This blade ships with a new gasket to ensure leak-free performance. This blade set replaces former part numbers 937-45, 4898, 24877, 209841, 4961. 0041 2725 2726 2742 2743 2771 4093-8 4094 4096 4100-8 4101-8 4102 4105-8 4106-8 4108-8 4109 4110 4111 4112-8 4114 4115 4117 4119-22 4122 4123 4125 4126 4127 4128 4129 4132 4134 4135 4141 4142 4143 4144 4150-126 4164-126 4165-126 4168-126 4204 4242 4245 4246 4247 4249 4255 4256 4258-022 4270 442 5000-08 5000-25 6010 6606 6607 6608 6628 6629 6630 6631 6632 6633 6634 6635 6636 6637 6638 6640 6641 6642 6643 6644 6645 6646 6647 6648 6650 6651 6652 6653 6654 6655 6656 6657 6658 6662 6663 6664 6665 6667 6668 6672 6673 6674 6675 6676 6677 6678 6679 6680 6681 6682 6684 6686 6687 6688 6689 6690 6692 6694 6696 6697-022 6698-015 6750 6751 6752 6753 6760 6792 6793 6795 6796 6797 6798 6799 6800 6801 6802 6803 6804 6805 6806 6807 6808 6809 6810-126 6811 6812 6813 6814 6815 6816 6817 6819 6820 6824 6835-022 6843 6844 6851 6852 6853 6854 6855 6870 6871 6872 6873 6874-022 6875-015 6878 6880 6881 6884 848-31 852-08 852-20 854-35 861-66 862-06F 867-28 869-18 880-20 887-20 890-08 890-20 890-22 890-22M 890-30 979-08 979-23 BPST02-B00 .